Using the best dog crates is a popular and effective training method for Dogs, they can be used from puppyhood all the way to adulthood. Dog crates are an effective training method and can be a home inside your home for your dog. What should you look for in a good dog crate? Why choose a wire crate? When would wire crates not be the best option? Why choose a plastic crate? Why choose a soft crate? When would soft crates not be the best option? To make your time on the website easier we’ve collated this table which highlights our favourite dog cage brands in the UK from the different categories. If you want to read the full reviews then they will be underneath. We’ve tested over 100 hundred dog crates and cages over many months with our own dog, Jeff. With this in mind, we have decided that there needs to be a clear winner. We will freely admit that most dog crates are almost identical in design and build so to say one one of them is the best over the rest is very hard. But we’ve got to pick one and we’ve gone for the RayGar wire dog crate as its construction is near perfect, it’s reliable and hard wearing and good value for money. Designed to be used for puppies, dogs and elderly this can be used both as a potty training aid and as a safe refuge for your dog to sleep – just make sure to get the best dog crate accessories such as a comfortable dog bed and a throw to put over to really turn it into a cosy den. It’s a lightweight metal wire mesh crate with a detachable and removable bottom layer which makes cleaning it easier. The crate’s wires are black and tough to remove so it will take some punishment before it starts to lose colour. The bottom layer is hard plastic that will not get wrecked even by the most rambunctious of dogs moving around and digging. When not in use, the RayGar dog crate @flat packs” which makes it highly portable and easy to take with you in the car. Just be mindful of the crate’s dimensions and your car’s boot space. You can get three sizes, medium (L76 X W53 X H59cm), large (L91 X W60 X H66cm) and extra large (L121 X W76 X H82cm). As you can see there is no small so if you have a very small dog or a toy dog then you should probably give this one a miss. You’ve got two doors so you can have the crate set up either side in your house and the locks can not be opened from the inside. The crate can be loud if you haven’t used enough soft fabrics such as beds, throws and so on. All in all, this is a fantastic dog crate and all you should ever need to housebreak a dog and/or to help create a safe place for them to chill and sleep. Highly recommended. The Felia Plastic Transport Crate is a superb plastic crate and our top choice for the best plastic crate. The crate is made of tough plastic which is absolutely solid and secure. It’s more than adequately ventilated with plenty of meshed windows for light which includes the windows across the sides of the crate. The unique 2 half design of the crate allows it to be more portable and easier to clean the harder to reach places. The loops and holes on the central unit help it comply with air travel should you need a dog crate to fly with. The door can be configured to open to the left or the right which is a rather trivial feature but there you go. We found the doorway to be of a decent size, big enough to be able to get in and out without a bump and small enough for it to become a ‘den’ if need be. Inside, it’s all hard plastic so you will require soft furnishings to be comfortable, but we think this is totally expected, right? You may struggle to fit a dog bed in there so be wary that you’ll need to invest in dog blankets and towels instead. The Felia Plastic Transport crate comes in 3 sizes – 67 x 51 x 47 cm, 80 x 56 x 59 cm, 90 x 60 x 68 cm. These sizes are smaller than wire crates and there is no size available for very large breeds such as Great Danes or St. Bernard’s -you’ll need a more specialist transport crates for those. We tested the smallest with our Jug, Jeff and he had no problem getting in and out and no problems with the comfort either as he slept like a log. When we picked the crate up he was a bit startled but as the crate isn’t too big he was not too bothered and it was easy to keep him stable. Overall, we couldn’t fault the Felia Plastic Transport crate as a robust and effective portable crate. It’s even comfortable enough to be used as a normal crate in-between journeys we think. Just make sure to pack plenty of dog blankets. Top Quality Plastic Transport Crate is made of solid plastic. It features metal latticed windows, which provide light and ventilation. The upper and lower shells of the crate are joined with secure click-locks, and equipped with additional security fastenings. The central join also features additional holes which can be used to provide even more security, for example by looping cable ties through them. (These measures are required by some airlines). 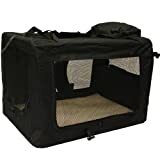 It was difficult to look past the Mool Lightweight Fabric Pet Carrier as the best soft dog crate and with almost 1500 amazon reviews it looks like we’re not alone. Despite being a soft dog crate, it’s steel frame allows to be both sturdy and soft which works great as both a home crate and a travel crate. The solid frame keeps your dog safe from knocks and gives it a permanent shape. The frame can be folded down when not in use which makes it extremely portable. The cover that goes over the frame is easily removed and easy to wash. The fabric is tough and durable which can handle being chucked about a bit in a car, during transit or out camping. Along the sides are mesh panels which lets your dog see their surroundings which can help a great deal with any anxiety they may have but there are also window flaps for when it’s bed time. On the inside you get a gorgeous and plush setting with a warm fleece and water polyester. This is a seriously snug crate for your dog and it’s as close to sleeping on a bed as you can get without actually giving them a bed. It’s called a lightweight carrier and it is just that. Despite the metal frame this hardly weighs anything so it’s easy to lug about. It’s also got some nice bonuses such as a food bag, treat pouch and the reversible mat. Jeff loved this crate the most and who can blame him when it’s so damn comfortable in there. We loved it too because of that as it made him less apprehensive to get in and less anxious once inside. You can get this in three sizes 60 x 42 x 42 cm, 70 x 52 x 52 cm and 81 x 58 x 56 cm. Make sure to measure your pet before purchasing! Overall, this is the best soft dog crate money can buy which isn’t a great deal as the price point is very generous! Ellie bo are renowned manufacturers of dog crates mostly of the wired mesh varied. They are simple, cheap, easy to use and are made to a high standard. The Ellie Bo dog crates typically come with two doors, one on the front and one in the side as well as a removable tray at the bottom to make it easy to clean. Although you may have typically seen Ellie Bo dog crates in black, they also come in Gold and Silver. They also come in a variety of sizes to fit any dog. More so, if you plan on crate training your dog from a young age you can get the Ellie Bo dog crate along with a crate divider so that you can gradually increase the size of the inside (too much space in the crate makes it easy for dogs to soil in them). 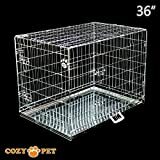 36" Folding Dog Cage. Folds flat for easy storage and transportation. Height 26" x Length 36" x Width 24"
The Petsafe dog crate is an outdoor dog crate/run made of galvanised steel that can keep your dog safe while outside. This is perhaps most suited in the spring or summer as the run doesn’t protect the dog from the cold at all, obviously. The latch is dog proof and the metal is very strong, your dog won’t be able to go through it and as long as you get the height right they won’t be able to go over it either. The petsafe dog crate is an ideal solution for those wanting to give their dog some outside time safely. Consider putting a kennel inside for them to be able to have a nap or get away from it all if they wanted to. The Croft brand of dog crates are another high quality brand, they are even approved by crafts! Their crates, however, are pretty much the same as the other wire mesh crate with two doors, a removable tray and they fold onto themselves for easy storage. Perhaps if you only want the biggest branded dog crate then the croft range of dog crates might be the ones for you. Personally, as an owner of a crossbreed the Crufts name doesn’t mean anything to me. Wire crates are probably best if it will be static in the house for a semi-permanent home for your dog, if you’re training your dog to be housebroken and don’t want them to be able to roam the house while you’re out then the wire frame crate may be your best option. Plastic dog crates come in many different shapes and sizes as and as such there are no one way to describe them unlike wire mesh dog crates. Generally, plastic dog crates are used as a safe method to transport your furry friend. They aren’t the most spacious of crates but they can be sealed easily so that the pooch comes to no harm. However, this is not to say that plastic dog crates can’t be used as a permanent rest area inside a home or as a training aid but we wouldn’t say they are primarily used for those reasons. A soft, fabric crate is a versatile dog crate which can be used in doors and in a car effectively. It could be argued that a soft crate is the best dog crate for car use. A soft crate comes in a few shapes and sizes but usually in a ‘dome’ shape with a few windows and a door which can usually be zipped closed for safe transport and to keep the dog secure. Soft crates may not be the most spacious but they can be very cosy and rigid enough to make a car journey very comfortable for the mutt. A dog crate can also be known as a cage or a kennel and it’s essentially a box-shaped home for your dog, typically the crates will have a door, sometimes two and it can be filled with the dog’s bed, toys (for puppy and tough toys) and food (wet food or dry dog food) and drink. Most dog crates are cubed with 6 faces and can be usually sealed/closed. Dog crates are typically made of wire mesh, solid plastic or a solid, softer fabric. The underside of the dog crate can have a removable tray in case your pooch has an accident while in there as well as making it easier to keep clean. 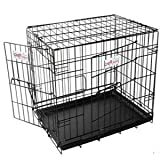 First of all, finding the best dog crate for you depends on what you need it for. Wire crates are typically made out of metal mesh which doesn’t get damaged easily and the wire frames keep its cubic shape. The mesh will comfortably keep your dog inside safe and sound while giving the owner years of use, the strength of a crate is especially important for larger, stronger and more boisterous dogs. A wired crate is easy to clean with disinfectant sprays and the removable tray at the bottom. A power wash can thoroughly clean the wires themselves and it will dry without damage. Wire frames have excellent ventilation to allow your dog to breathe easily. Usually, wire crates can collapse on themselves to be moved around easily. Make sure to get one that has this feature for increased portability. Wires are a tougher material than fabric and plastic which means a dog could hurt themselves more trying to get out. Let’s be honest, a wire crate looks like a prison before any furnishings. Consider getting a blanket to put on top to give it a nicer exterior. Wire rates can be a noisy solution to a dog who moves around a lot, however this can be negated with soft furnishings inside. As the wire mesh doesn’t cover much up, even the best wire crates for dogs can get a chilly if left in a colder room without furnishings on top. Features: METAL TRAY, HIGH QUALITY CONSTRUCTION, CARRY HANDLE, FOLDS FLAT FOR EASY STORAGE AND TRANSPORTATION. Plastic dog crates are easy to transport and typically smaller than usual so that it takes less space in a vehicle. Of course the difference in size means it may not be as comfortable as larger crates but they aren’t designed for comfort but rather practicality. Plastic crates can be cosy thanks to the smaller space and darker interior provided it’s filled with a nice thick blanket. Plastic dog crates are easy to store when not in use. When would plastic crates not be the best option? Plastic crates aren’t as ventilated as some others, especially wire crates and may not be suitable for long stays for the dog. Plastic dog crates aren’t as easy to clean as some others, such as wire mesh versions. This dog kennel provides your pet with safety on long and short journeys due to its lockable snap fasteners. It features Two large storage compartments offer extra space for treats and other accessories. Includes a practical plastic food and water bowl which can be attached to the bars at the front of the cage. Its door can be opened outwards or removed completely. Soft crates are…soft! This means that it’s a nicer environment for your dog and any rough behaviour wouldn’t result in injury, a wire mesh crate for example can be hard if the dog was to be jerked around. A soft crate can take a knocking without hurting the dog on a car journey. Most fabric crates can be collapsed and moved around easily. The fabric of a soft crate can help keep the heat in and help give your dog a nice warm sleep. Soft dog crates are not an ideal solution for permanent stays in the home, they can get dirty and are not easy to clean thoroughly. By their very nature, soft dog crates are easily chewable and badly behaved dogs can completely ruin the crate in a very short time. Other than that however, soft dog crates are a good option to have to be used from time to time.